The book Lean Inception explains what are the concepts behind the approaches that focuses on building the right product like MVP or Lean Startup. It then describes how to prepare and run the workshop that should provide this shared understanding, from writing the product vision to building the MVP canvas. This book is very pragmatic, providing a lot of tools and activity descriptions to support the recipe proposed by Paulo Caroli. It is also well-structured and easy to read. With an indeed lean approach, the explanations are concise and supported by a 60 pages appendix with an example of a workshop performance. I will recommend this book to every product manager, project manager, product owner, business analyst, scrummaster and startup entrepreneur dreamer that is concerned by building the “right product”. 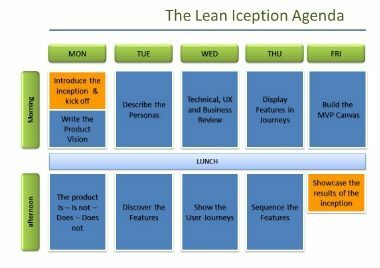 A lean inception is useful when the team needs to iteratively develop an MVP. Although the term is often misunderstood, the central property of an MVP is that it is something we build in order to learn whether it is worthwhile to continue building a product. So we choose features based on testing our assumptions of what is valuable to our users. For this we need to understand who our users are, what activity they do that the product supports and how to measure if they find the product useful. Never underestimate the power of having fun. By having fun and laughing, your stress levels decrease significantly and you are much more open to working with other people. When you’re happy and relaxed, you’re much more open to trying new things and thereby increasing your participation in this highly interactive workshop: the lean Inception. To the extent you want to be a part of engaging people deeply and fully with fun and effective activities, you will yourself be invited into a journey of highly participative sessions. Keeping this in mind, you need to break the ice and get the participants into the right state of mind. Icebreakers help to create a friendly environment and make people more comfortable to participate in the activities that will follow.